#Fukushima I Nuke Plant: Higher Radioactive Materials Outside the Silt Fence of Reactor 4 Than Inside? Some funny numbers for the Reactor 4's nuclide analysis at the silt fence at the water intake. TEPCO's press release on May 28 on the samples taken on May 27 shows the water OUTSIDE the silt fence for the Reactor 4 water intake had a much higher radioactive material concentration than the water inside the silt fence. This wasn't the case at all on May 25 samples whose level of radioactive materials was higher INSIDE the silt fence, as you would expect. Hmmm. The silt fence for the Reactor 4 water intake is not working? But why would the outside be more radioactive than the inside? If the typhoon No.2 dumps a whole lot of rain, they will overflow. Even if it doesn't, it looks just the matter of time. The top edge of the trenches is at the Onahama Peil (O.P., average sea level used for the plant) plus 4,000 millimeters. In other words, 4 meters (13.12 feet) above sea level. Japan Meteorological Agency forecasts heavy rain in Kanto and Tohoku areas on May 29 and 30 from a strong typhoon (Typhoon No.2; central pressure 960 hectopascal or millibar) coming up north from Amami Oshima (where the red circle is on the map above). According to Mainichi Shinbun Japanese (5/28/2011), TEPCO admits that Fukushima I Nuke Plant is not ready for the typhoon, and apologizes for the lack of preparation for the wind and rain. The company has been spraying the special resin on the radioactive debris and dust at Fukushima I Nuke Plant for a month to prevent the spread of radioactive materials by wind and rain, but the spraying is only half-way done. The Central Waste Processing Facility that has been storing the contaminated water from the Reactors 2 and 3 is near full, and the water levels in the trenches remain high. The Containment Vessels are leaking. Radioactive sewage sludge sold as cement, radioactive teas sold unchecked. Now radioactive debris in the middle section of Fukushima Prefecture to be burned and buried like normal debris, because the radiation level is "low", according to the Ministry of Environment. The Ministry of Environment has just given an OK sign to 10 towns and villages in the middle section of Fukushima Prefecture called "Naka-dori" region to burn, bury, or recycle the debris from the disaster (earthquake/tsunami) contaminated with radioactive materials, because the air radiation levels in these cities and villages were less than that of the city in the "Aizu" region (western third of Fukushima) with the highest level of air radiation. 1. Debris from the earthquake/tsunami in Fukushima's "Hama-dori" (ocean 1/3) and "Naka-dori" (middle 1/3) have been stored in temporary storage depots, but now in ten towns and villages [they are all in the south-eastern corner of "Naka-dori", the middle 1/3 of Fukushima, adjacent to "Hama-dori", the ocean 1/3] they can be processed as regular debris. However, just in case, they are to be processed within Fukushima Prefecture for the time being. As for shipping them and processing outside Fukushima, it is to be decided after the experts discuss in the meeting. 1) These towns and villages have their air radiation levels less than that of "Aizu" region [western 1/3 of Fukushima Prefecture], considered least affected by the Fukushima I Nuke Plant accident in terms of radiation contamination. Specifically, their air radiation levels are the same as or less than that of Sakashita-machi in the Aizu region that has the highest air radiation level in Aizu and also has a large amount of the disaster debris. 2) Air radiation levels at the debris depots were not much different from the background air radiation. In some cases, the air radiation level at the depot was lower than the level in the town. These 10 towns and villages have total of 6,155 tons of debris, which they can now burn, bury, or recycle. At the highest depot, the air radiation level at a distance of 1 meter from the debris was 0.31 microsievert/hour. That would be 2.7 millisieverts per year. In a post-nuke disaster Japan, that is totally OK and acceptable. The Ministry's release does mention the "clearance level" in passing (in page 2), which is one-hundredth of the annual allowable radiation dosage of 1 millisievert. The clearance level therefore is 10 microsieverts per year, or 0.001 microsievert/hour. Debris at the depots in these towns and villages, needless to say, exceeds this clearance level by a big fat margin. 1. Why does the Ministry ignore the clearance level, which is specified by law? The debris exceed the clearance level. I guess I know the answer to my own question. The Ministry of Education did it, and upped the radiation for kids to 20 millisieverts per year because "this is an emergency", with a promise to keep the actual exposure as low as possible without saying how. If the Ministry of Education can do it, so can the Ministry of Environment! Everybody's doing it! 2. How is it possible that the depots that have piles of debris with radioactive materials test lower in air radiation than background radiation? It just defies the common sense. You put the radioactive debris in one place, and the radiation measures lower? 3. Why is a town in Aizu region with the HIGHEST air radiation level chosen as a reference, instead of picking a town with the LOWEST radiation level, if the Ministry wants to ensure safety? I think I know the answer to my own question No.3. If the Ministry had picked the town with the lowest radiation level in Aizu, none of the debris in the "Naka-dori" region could be burned, buried, or recycled. 4. What is the point of deciding by the air radiation level at the debris depot, to begin with? So these debris in these towns and villages could have much higher radiation if the radiation were measured on the surface. But now the Ministry of Environment has given the permission for the debris to be burned without special filters or system to capture the radioactive materials, buried without consideration for groundwater or soil contamination, or recycled. Soon, the Ministry will allow the debris to be shipped outside Fukushima to be burned, buried, and recycled. Share the pain. Share the radioactivity. Let everyone suffer the consequence of TEPCO's and the government's mismanagement and pollute the entire country. That seems to be the Japanese way. Radioactive materials in concentration that was up to several hundreds of times the normal level were detected from the soil on the ocean floor in the 300-kilometer strip along the coast from Kesennuma City in Miyagi Prefecture to Choshi City in Chiba Prefecture. Oh what a surprise. Who could have known? The Ministry of Education and Science, who did the survey, even goes to contradict the oft-repeated statement by the chief cabinet secretary and says "the marine products may be affected." No word on other nuclides like plutonium, uranium, and strontium. I'm trying to locate the original survey data at the Ministry's site. The Ministry of Education and Science disclosed on May 27 that radioactive materials in concentration that was up to several hundreds of times the normal level were detected from the soil on the ocean floor in the 300-kilometer strip along the coast from Kesennuma City in Miyagi Prefecture to Choshi City in Chiba Prefecture. The Ministry says "the marine products may be affected". It is now confirmed that the radioactive materials in the contaminated water released [both intentionally and unintentionally] from TEPCO's Fukushima I Nuclear Power Plant into the ocean have spread far and wide. The soil samples were taken from May 9 to May 14 at 12 locations about 15 to 50 kilometers off the coast. Radioactive materials were detected in all samples. The highest concentration of radioactive materials was detected from the sample taken from the ocean floor, 126 meters deep, 30 kilometers off the coast of Fukushima I Nuke Plant. Cesium-134 was 260 becquerels/kilogram, and cesium-137 was 320 becquerels/kilogram. In comparison, in the survey done in 2009 in the approximately the same location, cesium-134 was not detected, and cesium-137 was 1 becquerel/kilogram. Iodine-131, whose half life is short and was not detected at all in the 2009 survey, was found at 1.6 to 6.1 becquerels/kilogram. The spread of cesium was more concentrated north of Fukushima I Nuke Plant. Cesium-137 at a location off the coast of Kesennuma City in Miyagi Prefecture, 70 kilometers north of the plant, was 110 becquerels/kilogram, whereas at a location off Kita-Ibaraki City in Ibaraki Prefecture, 70 kilometers south of the plant, it was 12 becquerels/kilogram. According to the Ministry, "There's a variation in the amount of radioactive materials due to the variation in ocean floor topography and the effect of the ocean current." It is actually a very cute animal, trying to eat as much as it can among much bigger "normal" rabbits. The video was uploaded on Youtube on May 21 by someone who says he/she lives in the area in Fukushima Prefecture close to Fukushima I Nuclear Power Plant. In one of the replies to the comments, he/she says the location is "500 meters from No.34 in the Ministry of Education's radiation map." No.34 in the radiation map is "Ookawara, Ookuma-machi, Futaba-gun, 7 kilometers from Fukushima I Nuke Plant, south by southwest." The youtube video has received a ton of negative comments from the Japanese viewers calling it fake and fear-mongering. Reading the comment by the person who uploaded it, I don't get that feeling and the video doesn't look like a fake, but it's just me. The person who uploaded the video says it is one of their rabbit, and it was born after they fed their rabbits with their favorite fresh green grass after the Reactor 3 blew up. He/she says "We were working in our backyard when the Reactor 3 blew up, which we didn't know at that time. Our faces and throats felt burned, and we thought we're going to die. So we fed the rabbits with their favorite grass." And "It's just too late, telling us after 2 months how contaminated the soil is around here. We've drunk from the well water, have eaten the wild mountain vegetables." What a cute little rabbit. Breed as a new breed. There's no proof that this video was shot in Japan! That cannot be in Fukushima. Dubious video. Yeah just blame everything on radiation, idiot. I've seen the rabbits with no ears or stunted ears. Nothing to do with radiation. You [the person who uploaded it]'re spreading the malicious rumor. You [the person who uploaded it] are crazy. You should go see the psychiatrist quick. Interestingly, many comments from people who take the video seriously and discuss the implications of radiation exposure (both internal and external) are flagged as "spam". TEPCO released the cost calculation for the AREVA's contaminated water treatment system on May 27, and denied the "rumor" (originated in the sources inside the Ministry of Economy, Trade and Industry) that it would cost 200 million yen per tonne of water. Instead, TEPCO said it would be "210,000 yen [US$2,585]" per tonne, and the total would be 53.1 billion yen [US$656 million] to process about 250,000 tonnes of water in the end. It was 200,000 tonnes of water only a few days ago, I think. And what "end"? Still no information on exactly what nuclides are to be removed and how much. Corporate secret. On May 27, TEPCO released the result of the cost calculation for the treatment system for the highly contaminated water in the turbine buildings and other locations at Fukushima I Nuke Plant, and it was 53.1 billion yen. It would be 210,000 yen [US$2,585] per tonne, and the cost would be borne by TEPCO. There was a "rumor" that the treatment cost would be several tens of trillion yen, but it was denied by TEPCO. The highly contaminated water is to be treated at the water processing facility that AREVA of France is building, and part of the water is to be returned to the reactors as coolant. The system is expected to be operational in mid June. According to TEPCO, there are 84,700 cubic meters (as of May 16) of the highly contaminated water. In the calculation, TEPCO estimated the total of 250,000 cubic meters of water to be treated, and added the construction costs for the facility and the temporary storage tanks, and the cost of water processing. The highly contaminated water is being transported from the turbine building basements to the Central Waste Processing Facility, but the cost calculation does not include the cost of this transport nor the cost to treat the less contaminated water. (UPDATE) A customer representative at the tea merchant answered my email and said "It was picked and processed mid April to early May." So that was before they tested for radioactive iodine and cesium. That was a cheerful e-mail message this morning from a Japanese tea merchant that I had bought from in the past. In light of what has transpired in Shizuoka - radioactive cesium detected in raw tea leaves and the finished, blended tea, governor refuses to test the bulk tea (aracha), and promise by the prefecture's tea merchants to aggressively market Shizuoka tea in cooperation with the prefectural government - I'll pass. A good doctor in Kumamoto, Japan who writes a blog in Japanese on Fukushima I Nuke Plant accident and the ensuing nuclear and radiation disaster that's slowly unfolding telephoned the Nuclear and Industrial Safety Agency of METI and asked for the names of the IAEA team that has been sent to investigate the Fukushima I Nuke Plant accident. NISA told Dr. Ono the list was released to the press, but not to the general public, but they sent him a fax anyway. The list reads like the attendance list of G20. More power to emerging economies! Does anyone know anything about these people, whether they are actually capable of assessing anything? Or is this just an international political theater? Many Japanese, including the doctor, are really counting on the IAEA investigation to reveal what's been hidden by the Japanese government and TEPCO. But I have a sinking feeling that won't happen, looking at the list. On May 26, the IAEA team went to a nuclear power plant to learn about what happened on the day of the earthquake. No, not Fukushima I. They went to Tokai II Nuclear Power Plant in Ibaraki Prefecture, where 1 of the 3 emergency power generators stopped temporarily and the seawater intake pump broke after the tsunami. That should help them assess the Fukushima I's situation. No doubt. Remember TEPCO has been transporting the highly radioactive water from the turbine buildings to the basement of one of the buildings of the Central Waste Processing Facility after they said they had leak-proofed the Facility? Leak-proof? Not so. The water level at the building dropped 5 centimeters, TEPCO announced on May 26, and that's equivalent of 50 tonnes of water. But TEPCO also assures us that it is not leaking outside the building. As the article below says, the Reactor 3's turbine building alone has 22,000 tonnes of highly contaminated water. The transfer to this particular building of the Central Waste Processing Facility only reduced that amount by 3,660 tonnes. All kinds of other solutions like "water entombment" were going to solve all kinds of problems, until TEPCO had to reveal that both the RPV and the Containment Vessel had holes. TEPCO announced on May 26 that the facility that received the contaminated water from the Reactor 3 turbine building at Fukushima I Nuke Plant saw the water level at the facility dropped by 5 centimeters in one day. The analysis of the ground water around the facility didn't show a marked increase in radioactive materials, which led TEPCO to conclude that it was unlikely that the contaminated water had leaked from the facility. TEPCO started to transfer the contaminated water from the Reactor 3 to the basement of one of the buildings that makes up the Central Waste Processing Facility on May 17, and stopped the transfer at 9AM on May 25 as the basement almost became full. But when the water level was measured at 7AM on May 26, it had decreased by 48 millimeters (4.8 centimeters) since 11AM on May 25. The decrease is equivalent of about 50 cubic meters [or 50 tonnes]. TEPCO thinks "there is a possibility that the 2nd floor of the basement in the building may have places that are not totally leak-proof, and the water is leaking from there into the corridor that connects to the other building of the [Central Waste Processing] Facility." If the leaks are found, the contaminated water there needs to be transported to somewhere else. However, the building that's been receiving the contaminated water from the Reactor 2 is almost full, and it will be hard to secure the space for the transfer. There are 22,000 cubic meters [22,000 tonnes] of highly contaminated water in the Reactor 3 turbine building. The building that this water was being transferred to has the capacity of 4,000 cubic meters [4,000 tonnes], but the transfer was halted after 3,660 cubic meters [3,660 tonnes] of the water had been transferred. After two months TEPCO is dribbling the information out which only proves the critics and fringe scholars and the "sensational" media abroad were right from the beginning. First was the news of core meltdowns in all three reactors, and after two months no one cared. Next, the news yesterday that the Containment Vessels, not just the RPV, have holes, and no one cared. So much for the "tsunami did it" narrative that's been adopted by the government, TEPCO, and the nuke industry. And so much for the "reactor will not break" myth cultivated by the nuke industry worldwide. TOKYO (Kyodo) --The pressure vessel housing nuclear fuel at the No. 1 reactor of the Fukushima No. 1 power plant or its accessory piping is likely to have been partially damaged immediately after the March 11 earthquake, possibly allowing steam to leak out to the containment vessel encasing it, according to data made public by its operator. At the reactor, the magnitude 9.0 quake registered an intensity smaller than envisaged under its quake-resistance design. But if the temblor actually caused damage to the critical reactor component, power suppliers across the country might be forced to reconsider the quake resistance designs for their reactors. A diagram showing temperature changes at the reactor's containment vessel indicates that temperatures and pressure momentarily shot up immediately after the quake. Mitsuhiko Tanaka, a former nuclear reactor design engineer, says high-temperature steam apparently leaked out to the containment vessel after either the reactor's pressure vessel or its accessory piping was partially damaged. The operator, Tokyo Electric Power Co., admitted Wednesday that critical cooling piping at the same plant's No. 3 reactor may also have been damaged in the quake. The utility, known as TEPCO, had earlier suggested that no major damage was done to the reactor, such as ruptures in the facility's main steam piping, until the arrival of massive tsunami after the quake. "If we do our analysis on the premise that there was a leak in the piping, it matches (data) in reality," a TEPCO official said at a news conference, referring to possible damage at the No. 3 reactor. "We can't deny the possibility." According to TEPCO, as soon as the reactor's emergency core cooling system was activated shortly after noon on March 12, pressure inside both the reactor's pressure vessel and containment vessel, which encases the pressure vessel, dropped, suggesting that steam was leaking from the cooling pipe. While measuring devices may have malfunctioned, pressure readings corresponded to an analysis based on the hypothesis that steam did indeed leak from the piping, TEPCO said. At the No. 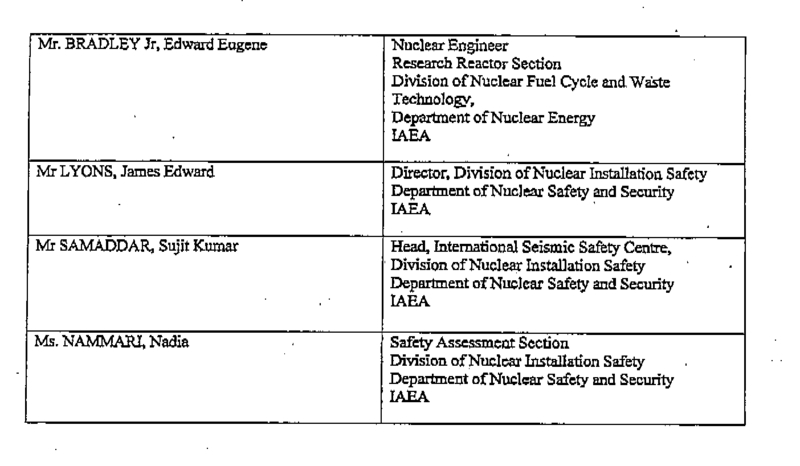 3 reactor, the earthquake had an intensity greater than envisioned under resistance guidelines. The cooling piping is housed in a building designed to resist direct damage from tsunami. "We must fully accept the fact that (the earthquake) has been cited as a possible" cause for the damage to piping, said Goshi Hosono, a special adviser to Prime Minister Naoto Kan, at a news conference. "A thorough investigation should be carried out on the cause of the incident" after the government's Nuclear and Industrial Safety Agency analyzes related data, he added. Agency spokesman Hidehiko Nishiyama stressed at the same news conference that steam leaks from the piping have not actually been confirmed. Another analysis by TEPCO has shown that breaches may have occurred to containment vessels encasing the Nos. 1 and 2 reactors at the power plant in Fukushima Prefecture, possibly causing leaks of highly radioactive water. The possible ruptures to the containment vessels at the Nos. 1 and 2 reactors are certain to complicate efforts to deal with accumulating contaminated water there, raising questions about the soundness of a TEPCO plan to rebuild a stable cooling system by around mid-July. In a report submitted to the agency, TEPCO said that if a breach around 3 centimeters in diameter occurred at the No. 1 reactor's containment vessel 18 hours after the quake and it widened to about 7 cm 50 hours after the quake, it would account for changes in pressure readings inside the containment vessel. TEPCO said it believes that parts used to ensure air tightness in the containment vessel may have broken from overheating, judging from temperatures measured when the leaking possibly occurred. The company also hypothesized that a rupture roughly 10 cm in diameter occurred to the No. 2 reactor's containment vessel 21 hours after the quake due to elevated temperatures, among other factors, finding that it also corresponds with data obtained. The same TEPCO report has also shown that massive amounts of hydrogen likely formed at the Nos. 1 to 3 reactors shortly after water levels dropped in their reactor cores and exposed nuclear fuel inside, possibly causing explosions at the buildings housing the reactors. According to TEPCO's analysis, about 750 kilograms of hydrogen gas was produced at the No. 1 reactor, between 350 and 800 kg at the No. 2 reactor and between 600 and 700 kg at the No. 3 reactor. Hydrogen is formed when zirconium cladding on fuel rods gets heated and reacts chemically with water. Between 300 and 400 kg of the gas quickly formed within an hour of exposure at each reactor, the analysis shows, though No. 2 was spared the kind of explosion that blew off the roofs of the buildings for the other two reactors in the days following the massive quake and tsunami. There is a possibility that the No. 2 reactor escaped an explosion because a ventilating hatch on the upper part of its building was opened in time, unlike at the Nos. 1 and 3 reactors. TEPCO is struggling to bring the three reactors and a spent fuel storage pool at the No. 4 reactor under control, with the plant's two other reactors having already been brought into a stable condition called "cold shutdown." He senses a danger that his cushy and prestigious position as the head of the Nuclear Safety Commission is in jeopardy over his alleged remark which may have caused the delay in cooling the Reactor 1 RPV. It is hard to believe he is a scientist and not a lawyer or politician. With that fine parsing ability of the words, he could make a wonderful assistant to a certain President of the United States (there are many candidates). "There is a possibility of recriticality if seawater is injected." After that remark was publicly announced at the government-TEPCO joint press conference, Madarame was furious, and took it as a personal insult (see my post). His rebuttal? "I couldn't have said such a thing." "The possibility of recriticality if seawater is injected is not zero." To an uncritical, non-scientific mind, that still means "there is a possibility". "When I say 'the possibility is not zero', it means 'it is practically zero'." Let me know when you figure that out. So says the Mainichi Shinbun reporters who must be reading the report submitted by TEPCO on May 23 and released on May 24. Multiple 10-centimeter holes in the Reactor 2 Containment Vessel, and one 7-centimeter hole in the Reactor 1 Containment Vessel. Hiroaki Koide of Kyoto University was so right. The Containment Vessels' integrity has been long gone. 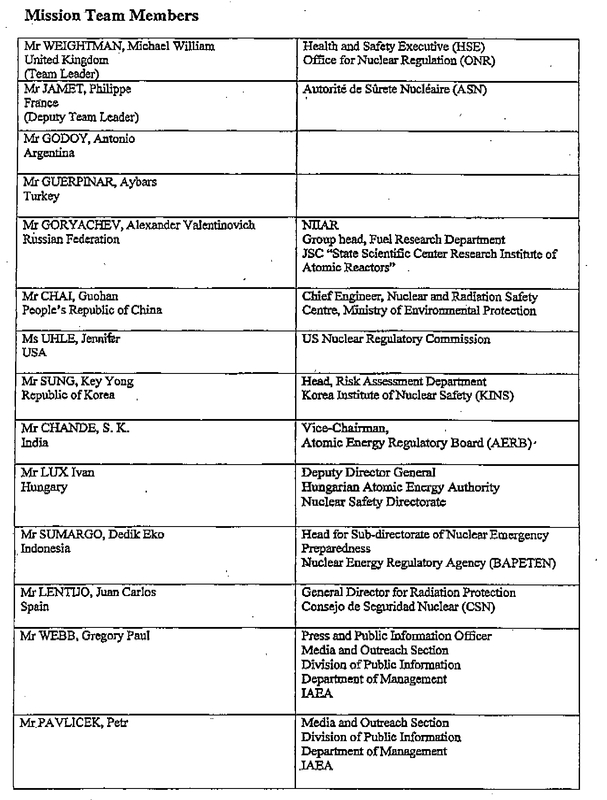 TEPCO should have known all along, and all the experts, including Koide, must have known. In the report that TEPCO disclosed on May 24 regarding the core meltdown in the Reactors 2 and 3, the possibility of holes in the Containment Vessels of the Reactors 1 and 2 is mentioned for the first time. The Reactor 1 Containment Vessel may have a hole 7-centimeter in diameter, and the Reactor 2 Containment vessel may have multiple holes 10-centimeter in diameter. According to the Mainichi article, TEPCO came to the conclusion of multiple 10-centimeter holes in the Reactor 2 Containment Vessel and one 7-centimeter hole in the Reactor 1 Containment Vessel from the analysis of the pressure data. Someone at Yomiuri Shinbun who was made to read the TEPCO's report to the Nuclear and Industrial Safety Agency (NISA), the government overseer, found this bit of information in the main report (225 pages, in Japanese; English translation is on-going at TEPCO): Containment Vessels were damaged within 24 hours of the quake. Looks like a fun reading. I will report back when I see the exact words from TEPCO on the subject. It's also amusing to see the Japan's MSMs now use the word "core meltdown (炉心溶融) quite often, which was a taboo word for 2 months until TEPCO officially admitted it on May 15. It's been revealed that the steel Containment Vessels of the Reactors 1, 2 and 3 that house the Reactor Pressure Vessels (RPV) may have been damaged within 24 hours after the earthquake on March 11, according to the detailed analysis of the core meltdown at Fukushima I Nuclear Power Plant by TEPCO. The result of the analysis was compiled into a report and submitted to the Ministry of Economy and Industry's Nuclear and Industrial Safety Agency on May 23. The detailed calculation of the reactors' operation data after the earthquake revealed that the bottom of the Reactor 1 RPV was broken after 15 hours after the earthquake because the emergency core cooling system didn't function well and the fuel started to melt down. There are many openings through which the control rods and the neutron measurement device goes through. The welded parts at the bottom, which do not have the same strength as the other part of the RPV, broke, and highly contaminated water that included the melted fuel may have leaked from there, according to the report. I've been thinking about the "Level 7" designation of the Fukushima I Nuke Plant accident. When the NISA announced "Level 7", they were still publicly (at least) assuming that the majority of the fuel rods were more or less intact and inside the RPVs; that the RPVs were intact, and the Containment Vessels were intact, except for the Reactor 2 (the Suppression Chamber was damaged). So, is it more likely now, that far more radioactive materials have escaped the reactors than the NISA or the Nuclear Safety Commission calculated? "Don't worry it's only 1/10 of Chernobyl" was another lie? Or, were their calculations based on the secret knowledge that the RPVs and Containment Vessels were broken in the very early stage of the accident? It's hard to believe that it actually happened in the post-Fukushima Japan, but it most certainly did. For the city's commercial tea growers, the Board of Education and teachers, it was more important to proceed with the pre-scheduled annual event and to promote the local industry (tea growing) than to ever so slightly think about the health and safety of the 10-year-olds. The event took place on May 11, and one week later, a high level of radioactive cesium (830 becquerels per kilogram) was detected in the tea grown and harvested in Bando City. On Wednesday May 11, the annual "Sashima Tea Field Study" was held in Ibaraki Prefectural University of Agriculture in Bando City. It was raining, but 3rd-graders from 13 schools in Bando participated in the study. 13 schools were divided into 6 groups, and took turns in learning about the tea. The field study was first started in Sashima district, which is famous for its Sashima tea, but when Bando City was created by merging Iwai City and Sashima-machi, the field study got bigger in scale. This photograph [photos were not cached] shows the pupils from the First Elementary School in Group 3. When a Bando City worker greets them, they greet back vigorously. The head of the Board of Education of Bando City greets the participants. The head of the Bando Branch of the Ibaraki Prefecture Tea Growers Cooperative explains tea growing, and the pupils listen attentively. Now it's time to go to the tea plantation and pick the tea leaves. Bright green, new tea leaves. It almost smells like brewed tea. Pupils holding up the tea leaves they just picked to the camera. They pick tea leaves in two rows. For some, it may be their first time to touch tea leaves. Teachers are having a good time with their pupils. Members of a Bando city citizens' group make tempura using the tea leaves that have been just picked by the pupils. Eating delicious tea-leaf tempura. For some, it may be their first time ever. METI will set up a market for the goods from the earthquake-hit areas to support the recovery! The first will be held on Wednesday May 25 to sell vegetables!! At the Ministry of Economy and Trade, we will display and sell traditional crafts, daily goods, and farm produce from the areas affected by the March 11 earthquake in order to promote the recovery in those areas. On Wednesday May 25, we will hold "'Ganbare' Fukushima! Produce Market" on the ground floor of the METI building, where the vegetables grown in Fukushima will be sold. The market is open to the general public, so please stop by. Details (vegetables subject to change, depending on the availability): asparagus, tomato, cucumber, blueberry jam, curry sauce with chickens grown in Aizu [western 1/3 of Fukushima Prefecture], ramen noodles, seasoned soy sauce. A US researcher Chris Allison did the simulation of one of the Fukushima reactors (Reactor 1) and concluded that the meltdown occurred 3.5 hours after the cooling system stopped. It was reported to the IAEA in late March. So they all knew, except for the hapless citizens of Japan and the rest of the world. Or they say "Oh we didn't know for sure until May 15 when TEPCO finally announced it," like Japan's PM Kan has said. We do not know for sure, because no one has looked inside the RPV and reported back to us. All we can do is to collect the evidence and hypothesize, and that has been pointing to a meltdown. Even the PM Assistant has admitted that they knew it was a meltdown early on. 4 hours 20 minutes later: temperature at the bottom of the RPV reaches 1,642 degrees Celsius, damaging the RPV stainless steel lining [melting point of stainless steel is 1,510 degrees Celsius]. If you can read English, you can read Wikipedia's various entries on nuclear reactor and reactor accidents, and would have figured out that there was no way that the Reactor 1's reactor core had not melted once the cooling system failed. I read several wiki entries ("corium", "meltdown", "Three Mile Island accident", "Chernobyl accident" and others), and that was my conclusion as a layman. I kept scratching my head right after the accident, watching the Japanese government vigorously attack anyone who hinted at a core meltdown and hearing TEPCO insist that the fuel rods were only partially "damaged". And why has this scientist kept quiet? A confidentiality obligation with a threat of jail time like Professor Kosako? A meltdown occurred at one of the reactors at the Fukushima No. 1 Nuclear Power Plant three and a half hours after its cooling system started malfunctioning, according to the result of a simulation using "severe accident" analyzing software developed by the Idaho National Laboratory. Chris Allison, who had actually developed the analysis and simulation software, reported the result to the International Atomic Energy Agency (IAEA) in late March. It was only May 15 when Tokyo Electric Power Co. (TEPCO) admitted for the first time that a meltdown had occurred at the No. 1 reactor at the Fukushima nuclear plant. According to Allison's report obtained by the Mainichi, the simulation was based on basic data on light-water nuclear reactors at the Laguna Verde Nuclear Power Plant in Mexico that are about the same size as that of the No. 1, 2, and 3 reactors in Fukushima. According to the simulation, the reactor core started melting about 50 minutes after the emergency core cooling system of the No. 1 reactor stopped functioning and the injection of water into the reactor pressure vessel came to a halt. About an hour and 20 minutes later, the control rod and pipes used to gauge neutrons started melting and falling onto the bottom of the pressure vessel. After about three hours and 20 minutes, most of the melted fuel had piled up on the bottom of the pressure vessel. At the four hour and 20 minute mark, the temperature of the bottom of the pressure vessel had risen to 1,642 degrees Celsius, close to the melting point for the stainless steel lining, probably damaging the pressure vessel. TEPCO, the operator of the crippled Fukushima nuclear plant, had tried to fill the containment vessel of the No. 1 reactor with water, but it decided to abandon the plan after it discovered that a meltdown had occurred at the reactor. Masanori Naito, director in charge of safety analysis at the Institute of Applied Energy, said, "TEPCO could have conducted similar analysis at an early stage and assumed the meltdown had occurred. TEPCO should have prepared other cooling methods besides the method of filling the reactor with water." Hiroaki Koide: "Pressure Not To Release Radiation Data"
In the testimony in the Japan's Upper House Government Oversight Committee, Hiroaki Koide of Kyoto University said there was an outside pressure on him and his colleagues not to release the survey data including the radiation data on March 15. The committee hearing is still on-going. Access is still spotty. Hiroaki Koide of Kyoto University is testifying in the Upper House government oversight committee. The session is broadcast over the Internet, but the Upper House site is being overwhelmed with access requests. Alongside Koide, Masashi Goto, whistleblower ex-Toshiba engineer who designed the containment vessel at Fukushima I Nuke Plant, Masayoshi Son of Softbank, geologist Katsuhiko Ishibashi are also there. In the meantime, angry and concerned parents and citizens are swarming the Ministry of Education and demand that the government withdraw the 20 millisievert/year radiation (external only) limit for children. The Minister is hiding. They are holding a meeting outside the Ministry. Each time some punk of a bureaucrat utters something, he is being shouted down by angry protesters, demanding the Ministry retract 20 millisievert/year. "Why can't you understand? What can't you understand?" they are shouting at the bureaucrat. I'm watching live on USTREAM. I mentioned the system called the WSPEEDI simulation system in passing when I wrote about SPEEDI data for the early period of the Fukushima I Nuke Plant accident (March 11 onward). When Professor Kosako resigned from his post as PM special advisor in protest of the 20 millisievert/year radiation limit for school children, he called for the release of WSPEEDI, which can cover much wider area ("several thousand kilometers", according to Professor Kosako). Well well. The Ministry of Education very quietly put the WSPEEDI simulation data on their webpage for SPEEDI data list on May 10, without any fanfare, without any media (I mean MSM) coverage. The Ministry released 2 simulation maps, one for March 24 and another for March 25. They are only about iodine-131. So this is what TPTB wanted to hide at all cost, and released in a sneaky fashion after 2 months, and it's only about iodine-131 whose half life is 8 days. Where there's iodine-131, there's got to be cesium, but they are still mum on cesium or any other radionuclides. No WSPEEDI data from the earlier days, nor after March 25. The Reuters' article is here.